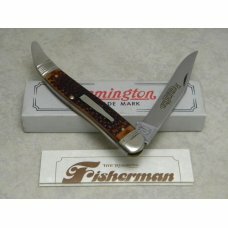 Remington USA 1999 Delrin R103 Ranch Hand Bullet Jack Knife in Box - Delrin Handles - No Cracks - Nickel Silver Bolsters - Brass Liners - Snaps Open a..
Remington UMC USA 1998 Delrin R293 Bullet Hunter Trader Trapper Knife in Box - Delrin Handles - No Cracks - Nickel Silver Bolsters - Brass Liners - Sn..
Remington Bullet USA 1997 Wood R4468 Lumberjack Knife in Box - Wood Handles - No Cracks - Nickel Silver Bolsters - Brass Liners - Snaps Open and Shut ..
Remington UMC USA 1996 Delrin R3843 Bullet Trailhand Utility Knife in Box - Delrin Handles - No Cracks - Nickel Silver Bolsters - Brass Liners - Snaps..
Remington UMC USA 1995 Delrin R1273 Bullet Master Guide Knife in Box - Delrin Handles - No Cracks - Nickel Silver Bolsters - Brass Liners - Snaps Open..
Remington Bullet 1994 R4243 Delrin "Short Bolster" Camp Knife in Box - Delrin Handles - No Cracks - Nickel Silver Bolsters - Brass Liners - Snaps Open..
Remington Bullet 1994 R4243 Delrin "Long Bolster" Camp Knife in Box - Delrin Handles - No Cracks - Nickel Silver Bolsters - Brass Liners - Snaps Open ..
Remington UMC USA 1992 Delrin R1253 Bullet Guide Lockback Knife in Yellow Box - Delrin Handles - No Cracks - Nickel Silver Bolsters - Brass Liners - L..
Remington UMC USA 1992 Delrin R1253 Bullet Guide Lockback Knife in Green Box - Delrin Handles - No Cracks - Nickel Silver Bolsters - Brass Liners - Lo..
Remington Bullet 1991 R1178 Delrin Mini Trapper Knife in Box - Delrin Handles - No Cracks - Nickel Silver Bolsters - Brass Liners - Snaps Open and Shu..
Remington Bullet 1988 R4466 Delrin Muskrat Knife in Box - Delrin Handles - No Cracks - Nickel Silver Bolsters - Brass Liners - Snaps Open and Shut - N..
Remington Bullet 1987 R1613 Delrin Fisherman Toothpick Knife in Box - Delrin Handles - No Cracks - Nickel Silver Bolsters - Brass Liners - Snaps Open ..
Remington Bullet 1986 Delrin R1263 Hunter Large Trapper Knife in Box - Delrin Handles - No Cracks - Nickel Silver Bolsters - Brass Liners - Snaps Open..
Remington Bullet 1985 R4353 Delrin Woodsman Knife in Box - Delrin Handles - Rear Top Center Rivet Crack - Nickel Silver Bolsters - Brass Liners - Snap..
Remington UMC USA 1984 Delrin R1173L Baby Bullet Lockback Knife in Box - Delrin Handles - Both Lanyard Holes Cracked - Nickel Silver Bolsters - Brass ..
Remington Bullet Reproduction Camillus Made 1988 R4466 Muskrat Mint Remington UMC, Made in USA. Made by Camillus, authorized reproduction made in 1988.. 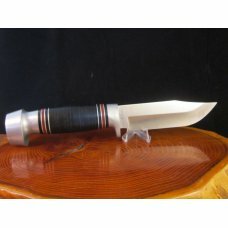 Very nice knife.There is no pattern number so I’m not a 100% sure which one it is. 3 1/4 inches long. Both handles are crack free. All 3 blades snap o..
You get two Remington acorn shields for your money. Both have been used and sharpened. All blades in both knives snap open and closed. 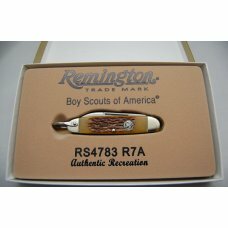 Handles do have..
Remington Bullet 1982 - 2007 Cocobolo R1128 Silver Anniversary Trapper Knife in Tin - Genuine Exotic Cocobolo Wood Handles - No Cracks - Nickel Silver..
Remington UMC Made in USA 1991 Delrin R1178 "The Deer Hunter" Bullet Mini Trapper Knife in Box - 1 of 2000 - Serial # 745 - Imitation Stag (Delrin) Ha..
Remington UMC Made in USA 1990 Delrin "The Pheasant Hunter" Folding Hunter Knife in Box - 1 of 2000 - Serial # 429 - Jigged Delrin Handles - No Cracks..
Remington 1992 R1123-A Bullet Trapper Tenth Anniversary Knife in Presentation Tin - 440 Stainless Steel Spey and Clip Blades - Lanyard Hole - Full Col..
Remington UMC USA R6 Delrin Skinner Fixed Blade Sheath Knife in Box - Imitation Stag (Delrin) Handles - Nickel Silver Bolsters - Very Nice Unused Con.. BRAND: Remington MAKER: Camillus PATTERN: Daddy Barlow R1240 LENGTH (Closed): 5” BOLSTERS: Nickel silver SHIELD: Musket with Powderhorn shi.. 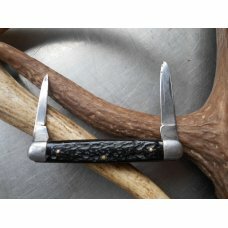 This is a vintage REMINGTON UMC hunter knife. It is the RH 36 model. The blade is saber ground with blood groove and measures 5 7/8 inch from face of .. 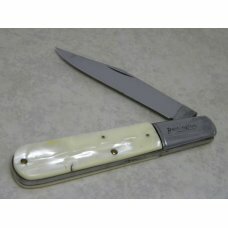 This is a vintage pearl remington LOBSTER pattern knife. 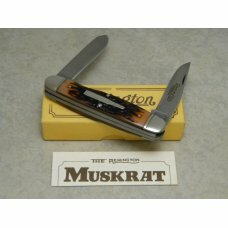 This knife measures 2.750 in the closed position.The knife has a master blade ,a pen blade a..
Remington USA Stag Canoe 2000 Wildlife Knife in Box - 1 of 1500 - Serial # 0864 - Stag Handles - No Cracks - Nickel Silver Bolsters - Brass Liners - S..
REMINGTON BAREHEAD JACK KNIFE measures 3 1/2" closed. Both blades stamped with good snap and half stops. No pattern number on pile side of master blad..
Remington UMC USA 1984 R1303 Delrin Bullet Lockback Knife - Delrin Handles - Cracked at the Front Lanyard Hole - Nickel Silver Bolsters - Brass Liners..
Good old Remington Rough Black Camp Knife Been toted ,sharpened & cleaned . one spear pointblade ,one screw driver& bottle opener & one can opener . 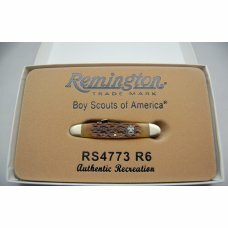 ..
REMINGTON Butter Bean Pen Knife measures 2 13/16" closed. 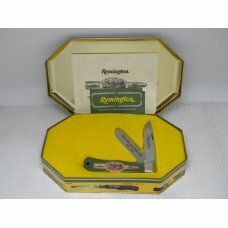 No pattern number but both blades are stamped with the Remington logo. Knife is in uncleane.. 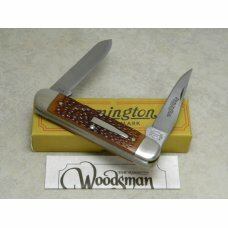 It is believed that in the 1980's Remington recreated this old design by having Camillus manufacture this Classic hunting knife design knife in the US..
Remington 175th Anniversary 1816-1991 RH33C Fixed-Blade Knife with Wood Display Board - Nice Stacked Leather Handles - No Wobble - Nice Unused Conditi..
Remington 1 Line Script Jigged Black Jack Knife c.1930's - Clip Master Blade - Jigged Black Composition Handles - No Cracks - Nickel Silver Bolsters -..
Remington 1 Line Script Jigged Black Jack Knife c.1930's - Spear Master Blade - Jigged Black Composition Handles - Rear Left Rivet Crack - Nickel Silv.. 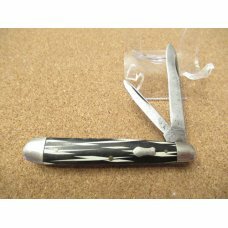 Older Remington Pattern # R2095 Black & White Composition handle . 3 1/8" closed . Used still a nice old knife . Thanks for looking Gary..
1989 Remington Silver Bullet Trapper 1 of 5000 # 1438 . Pattern R1128 SB . Never carried or sharpened. 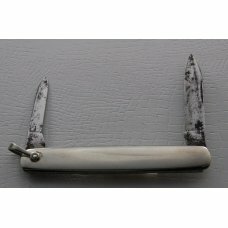 Nice Fat Bone Handle that are chip & Crack fre..
We are pleased to offer this Remington Vintage pocket knife in Very Good Condition. 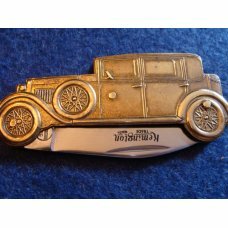 This 2-Blade 3" long pocket knife has wonderful Metal handles and..
We are pleased to offer this Official Boy Scout pocket knife in Mint condition. 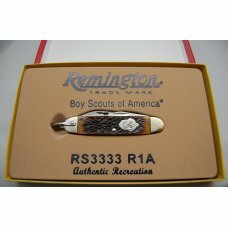 This 3-blade pocket knife is 3 3/8" closed and has wonderful Brown Ji..
We are pleased to offer this Official Boy Scout pocket knife in Mint condition. 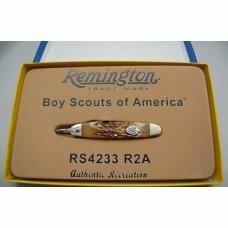 This 4-blade pocket knife is 3 3/8" closed and has wonderful Brown Ji..
We are pleased to offer this Official Boy Scout pocket knife in Mint condition. 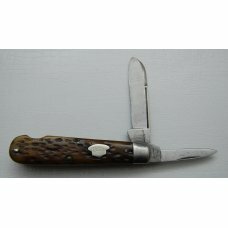 This 4-blade pocket knife is 3 5/8" closed and has wonderful Brown Ji..
Remington UMC Circle #963, Brown Bone Covers, 3 1/2" closed, correct sheepfoot blade is 95% full with some slight sharpening marks, nickel silver bols..
Remington UMC Circle #4235, Red, White & Blue Celluloid Covers, 3 3/8" closed, long pull spear blade is 99.9% full, short screwdriver, pinched and lin..
Remington Made in USA Cracked Ice Daddy Barlow Knife c.1930's - Cracked Ice Celluloid Handles - Front has a Gouge in the Handle (See Pictures) - No Cr..
Remington UMC Made in USA Genuine Saw Cut Bone RB43 Long Pull Spear Master Barlow Knife c.1920's - Genuine Bone Handles - No Cracks - Iron Bolsters - ..